Here's what you need to know about a technology that's sweeping the digital realm. Virtual reality (VR) is a term used to describe three-dimensional computer-generated environments that replace the normal reality in which our everyday lives play out. VR environments are often described as “immersive” because they engage a user's vision — and in some instances touch — to provide a seemingly three-dimensional simulated world to interact with or explore. Many people have already experienced virtual reality games, and VR is of growing importance for training and education in fields like medicine, engineering, and the sciences. Some of the world’s leading technology companies — including Microsoft, Sony, Google, Facebook, Apple, and Samsung — are spending heavily to develop VR equipment and applications. In its simplest forms, virtual reality is experienced as 3D graphics, images, or 360-degree videos on computers or smartphones running mobile apps. More elaborate VR systems use wraparound computer displays or even entire rooms with high-resolution displays integrated into the walls. Increasingly, virtual reality environments are experienced through VR headsets, or goggles. These can be dedicated headsets, like the Oculus VR system and the HTC Vive. Alternatively, a headset adaptor and mobile app software can turn a smartphone into a 3D display, like Samsung’s Gear VR system. VR headsets track your head movements and adjust what you see depending on where you look — so the virtual world appears to exist in all directions. 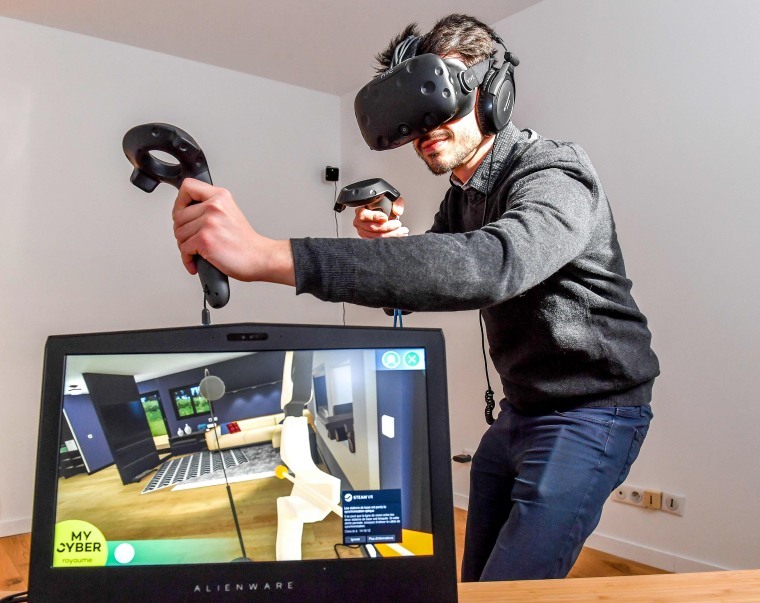 Many VR systems let you control this virtual environment with hand controllers or gloves, including so-called "haptic" models that vibrate to provide a sort of virtual touch. What can I do with virtual reality? Have fun in 3D. Virtual reality games have boomed in recent years, in part because VR headsets have become more affordable. Many multiplayer games, like Gaijin’s War Thunder, now work with virtual reality equipment that puts players inside the game world. Look back in time. Mobile apps like Lithodomos VR make it possible to visit ancient sites, such as the Acropolis in Athens or the Western Wall in Jerusalem. Dive deep. Virtual reality techniques like 360-degree video and detailed 3D models let landlubbers go underwater to visit famous shipwrecks. Smartphone VR systems use a headset adaptor that can cost from a few dollars to around $80 for high-end versions like the Google Daydream VR. (Of course, you'll need a high-resolution smartphone capable of running VR mobile apps.) Samsung’s Gear VR headset costs around $100, plus the cost of a VR-enabled Samsung smartphone. Dedicated VR headsets cost from about $400 for the Oculus Rift or Sony’s Playstation VR headsets to about $600 for the HTC Vive. It’s possible to create your own three-dimensional virtual reality environments and 360-degree video using specialized VR cameras like the GoPro Odyssey. But at a cost of about $15,000, the necessary gear isn't cheap. In addition to VR, many companies are now working to develop technology for so-called augmented or mixed reality, which blends the view of the real world with computer-generated graphics. The most familiar examples of AR gear are wearable see-through displays, commonly called smart glasses.